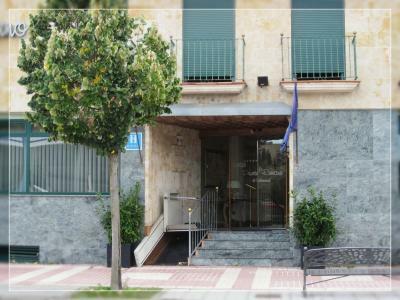 Lock in a great price for Hotel Puente Romano de Salamanca – rated 8.7 by recent guests! 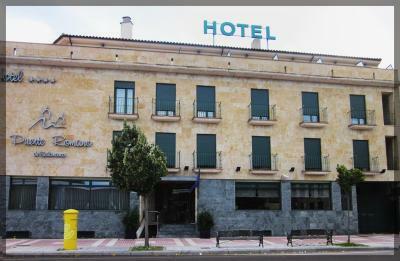 We enjoyed a very comfortable stay in this hotel very close to the Roman Bridge. 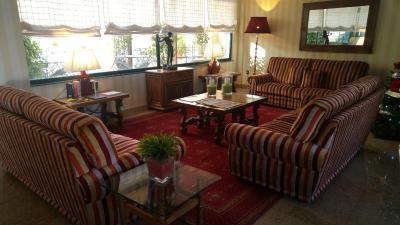 Our triple room was spacious and warm, with a mini bar, balconies and large bathroom. 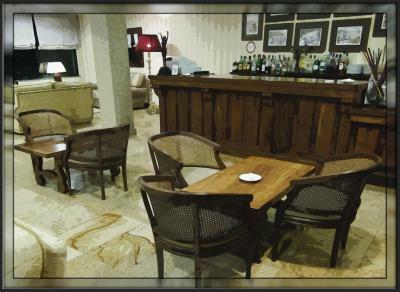 The lobby area is attractive and contains a small bar. 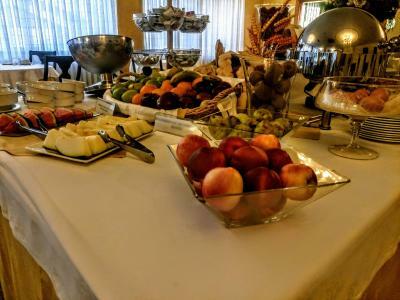 A buffet breakfast (for an extra fee) was served in a bright and pretty dining room. We stayed during winter and the pool so did not explore the pool and outdoor areas. The parking garage was spacious, easy to access, and good value for money. We were able to park our car with roof box safely and securely. Great location. Friendly staff. Clean. Good price. Can’t ask for much more. Very nice hotel, very clean, large room, comfortable linens. Steps away from the Roman bridge and historical center. Parking was not a problem. The buffet breakfast was a good value. Breakfast was good and reasonably priced. Parked in a forecourt opposite for duration of our stay. Marvellous big room and bathroom, very comfortable beds, there was a lift in the building and an inside parking under the building. A ten-minute walk over the roman bridge takes you to the town centre, we had dinner around the corner in a small typical Spanish restaurant that was charming.and had good food. 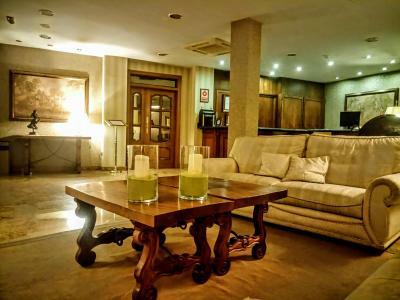 Beautiful hotel, room, dining room on site parking and near cathedral, Roman bridge. Staff was exceptional!! 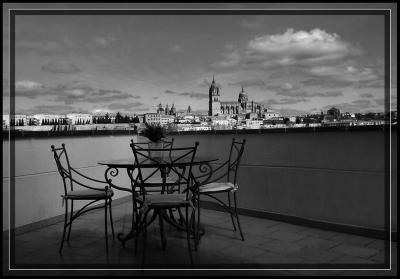 We'll start with the positives - situated in a quiet area, across the bridge from the bustle and climb into Salamanca centre and our room had a small balcony and a side view of the city's spires. The lobby and reception welcome were both very pleasant and secure parking beneath the hotel was a bonus. Rosa, the only member of staff in the breakfast room, worked hard to replenish supplies, as well as re-lay tables during busy periods and did so with good humour. 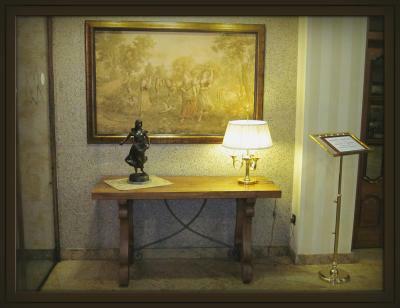 Our room was tastefully furnished, the bed was comfortable and hot water was plentiful at all times of the day. The room, including bathroom, were spacious and very, very comfortable. 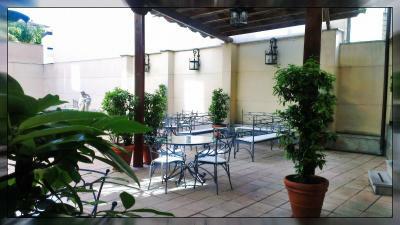 There was a balcony terrace off the room that added space and relaxing comfort. The price for this level of room convenience to the old city and the Roman bridge was astounding. 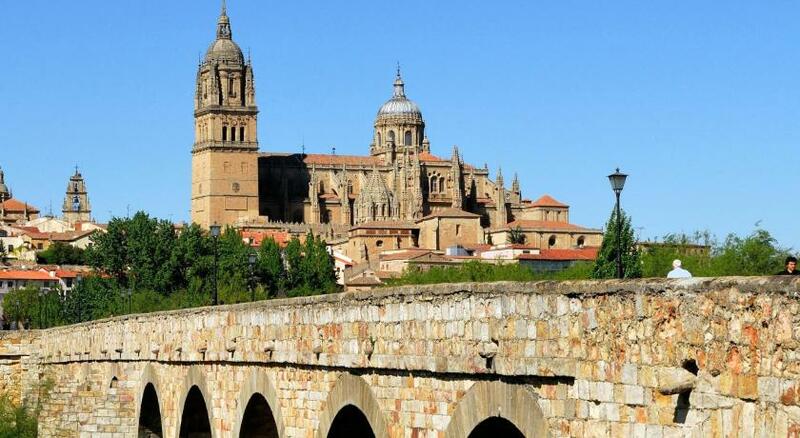 I plan to return to Salamanca and I hope that no one reads this so I can get a great room at a great price again. Great location, easy to find if driving and for getting back on the motorway. You step out of the hotel and just cross the road and the bridge in front and you are straight into the old town. Staff helpful and friendly. Large bedroom with all the facilities. Breakfast buffet style and plentiful. Would certainly stay again if we were in the area. 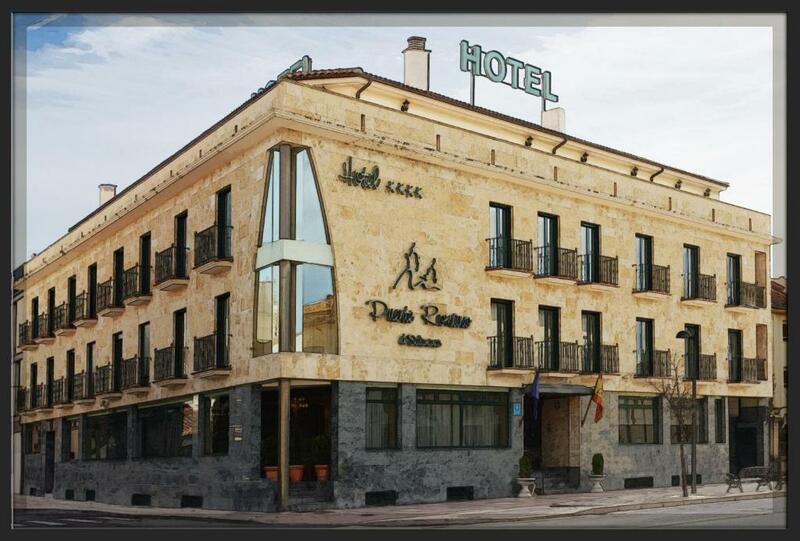 Hotel Puente Romano de Salamanca This rating is a reflection of how the property compares to the industry standard when it comes to price, facilities and services available. It's based on a self-evaluation by the property. Use this rating to help choose your stay! 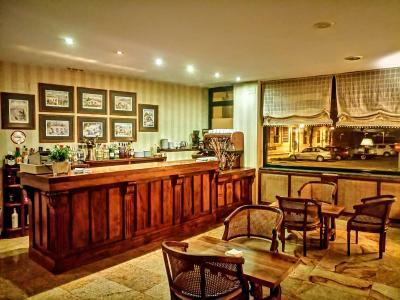 Set in an impressive stone building, this hotel is located next to the Roman Bridge. 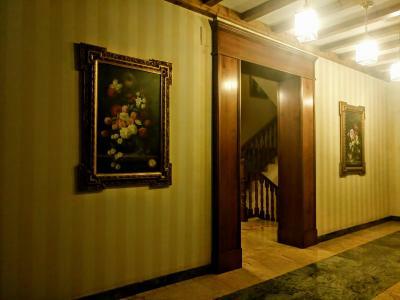 It features bright and spacious interiors, decorated with classic décor. 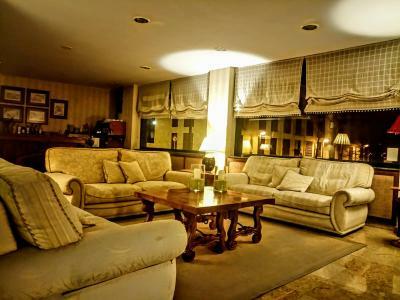 Rooms at Puente Romano de Salamanca include a private balcony or terrace, air conditioning and free Wi-Fi. The large, tiled bathroom comes with a hairdryer. 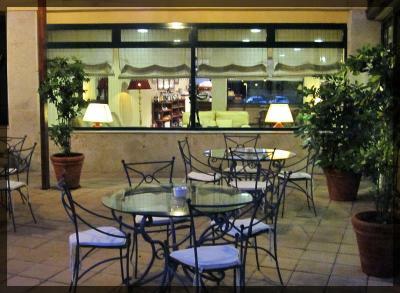 The hotel has a furnished summer terrace. It is surrounded by plants and sun loungers. Breakfast is served in the dining room at Puente Romano de Salamanca. 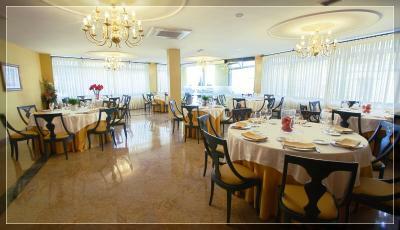 The friendly staff are happy to recommend restaurants in Salamanca for evening meals. 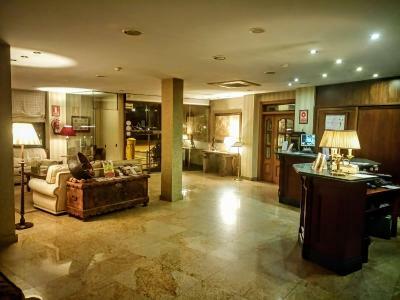 Puente Romano Hotel is 10 minutes’ walk from the center of Salamanca and its cathedrals. Parking is available on-site, for an extra cost. 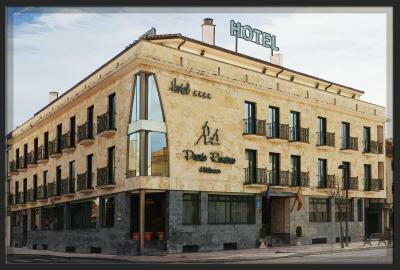 When would you like to stay at Hotel Puente Romano de Salamanca? 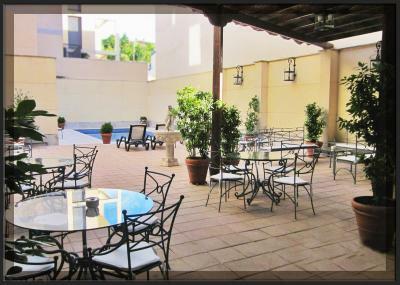 This bright, spacious room includes a private balcony or terrace, air conditioning and free Wi-Fi. The large tile bathroom has a hairdryer. 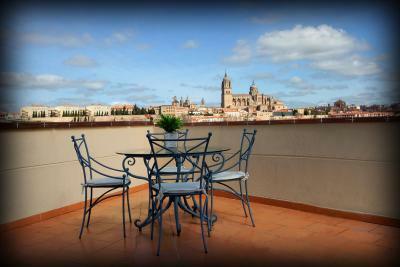 This more spacious room type features a terrace with views of Salamanca. It includes air conditioning and free Wi-Fi. The large tile bathroom has a hairdryer. 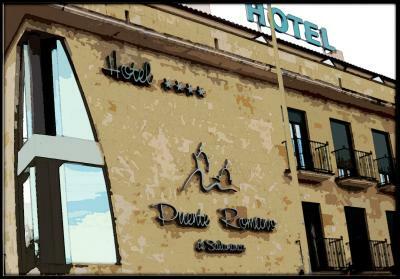 House Rules Hotel Puente Romano de Salamanca takes special requests – add in the next step! 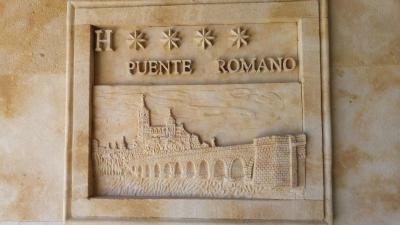 Hotel Puente Romano de Salamanca accepts these cards and reserves the right to temporarily hold an amount prior to arrival. Nothing it was great...wish we could have stayed longer .. The service ..the attention to detail... the breakfast...the view from our balcony over Salamanca to the Cathedral especially at night with it all light up ..stunning ..wish it was warmer to have had breakfast on the balcony..
Everything. We managed to park for free opposite, saving ourselves the €11 overnight charge. 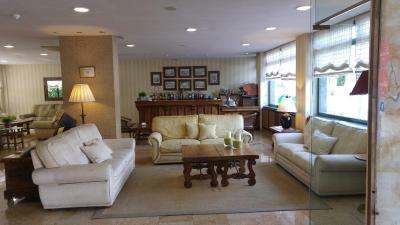 The hotel was modern, and everythig you would expect from a four star hotel, except the price. I thought it was really cheap. We paid €120 for bed and breakfast in a triple room. The breakfast was superb. The hotel is perfectly placed just across the Roman bridge from the old town, so about a 10-15 walk into the centre. 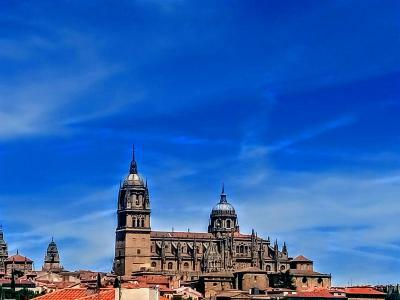 Holefully we will come again to Salamanca and definitely stay there. Good facilities. Ten minute walk to the old city. The local little tapas restaurant round the corner has closed unfortunately - no fault of the hotel though! We have stayed here several times on our way to or from the western Algarve, as it is easily accessible from the motorway. This time we had a lovely little roof terrace/balcony with a view over the river (and the roman bridge after which the hotel is named) to Salamanca town and the cathedral. The bathroom was well equipped. 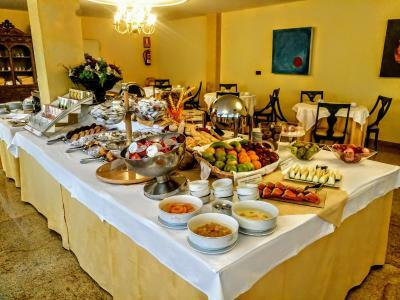 The breakfast was a self service buffet, but had many hot and cold dishes, as well as fresh rolls, croissants, fruit juices and fresh fruit etc. 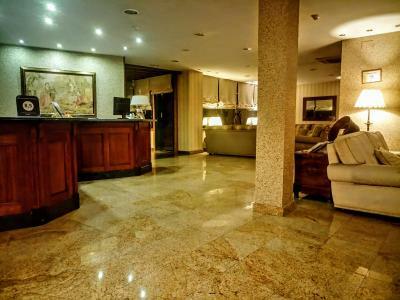 There is a private garage in the basement of the hotel, although you cannot book a space (we've never been disappointed, although we usually stay in November or February). 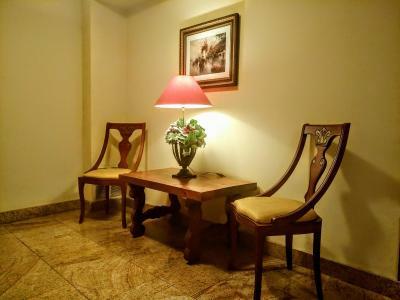 Excellent facilities and well placed outside the congestion of the old city. 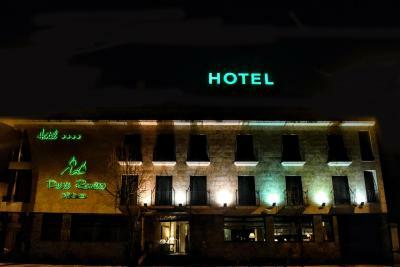 We always stay here when we visit Salamanca. There are not many restaurants near this hotel, and on a very cold winter's night, the walk across the bridge to the old city was unappealing. Ask for recommendations for dinner (we didn't), or be prepared to walk into the old town. It’s the 10th time we’ve stayed there, so we obviously cant find a fault with the establishment.! The lift from the under-garage, to all floors. Linen and towels were excellent. A really good location to walk from, up into town, with a stunning view as you cross the old Roman bridge. 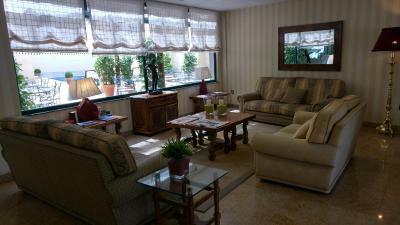 Spacious room, friendly staff, close to the Romano Bridge so an easy walk into town. Good, secure parking. Great location, near to the Romano Bridge which connects to the beautiful old quarters. Spacious and clean room. Friendly and helpful staffs, helping us to find the most convenient way to travel Segovia. A good spread of breakfast, and the lady staff in charge of the restaurant is so attentive.